Roy Scheider doing his 70s thing. 1. There are scarcely any ladies in it. This is a movie by for and about men. They do manly things. They smoke cigars, they chase each other in cars. They meet at piers, they drink beers. This movie is all about men meeting, plotting and occasionally killing, all while wearing smart leather jackets and trench coats. The scenes in which women do appear are brief and these women are either wives, waitresses or nurses. They include a wife who says little and brings her husband some mixed drinks. She appears later as a whimpering crying mess when her husband's criminal activities bring the police bursting into her home brandishing weapons. The waitresses and nurses say nothing at all. 2. Roy Scheider is in it. Studies have shown that Schieder's presence in a film ups the 70s quotient dramatically. 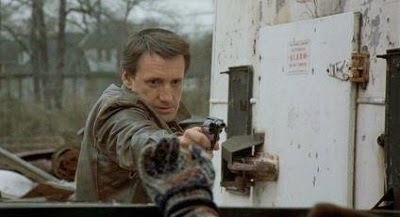 Seriously, Scheider is the quintessential 70s male action hero. Made famous by his roles in Jaws and The French Connection, he's stoic, intense, lean and wears a suit well. 3. The background music rarely matches the scenes. The incongruity of the music actually works quite effectively during a scene in a car wash that is far more tense then might have been intended. The music used here isn't action movie music at all, but rather the kind typically reserved for thrillers. Other times the music is far too jaunty or vaguely disco-ey. This is an entirely 70s film phenomenon. There are countless films from this era in which scenes are made jarring, dramatic and odd through bizarre selections of music. In an unusual way it makes the films more realistic. It's almost as if the music is coming from someone's radio nearby. 4. The bad guys are suited up and look like bankers. 70s era bad guys are the best. Suits, tweed coats and subtle bell bottoms are everywhere. These men are grey-haired, paunchy and look like they belong in an office or board meeting somewhere. The scenes in which they gather to discuss their nefarious business are made all the more interesting because these men manage to appear both sinister and totally on the up and up. 5. The car chase that lasts forever. Nearly every action film of every era has at least one car chase. But this scene is about fifteen minutes long. Roy Scheider weaves his car through the streets of New York in pursuit of some shadowy bad guys while the snappy soundtrack plays. Out of the city and onto the highway the car chase continues. It ends with Scheider looking believably dazed and bloody. 6. It requires an old-fashioned attention span. This is a film that reveals quite clearly the change in the attention span of viewing audiences over the years. Scenes are longer and the actions and motivations of the characters are not explained in depth or at all. The casual modern viewer of this film will get lost easily. Though the car chases and shoot outs and fighting abound, it is paced in a totally different way than modern films. 7. There aren't any heros here. Unlike 80s films, the police aren't really portrayed as great, noble men. They are shown instead as driven to do the job because they need the money or they are just driven and intense in general like Scheider's character. Moreover, the lack of heroism and heroics underscores the general grim tone of the film. Shot in winter in and around New York City, there is a grey heaviness over everything. Most scenes seem to take place in isolated places of subtle decay such as industrial settings, empty piers or lonely stretches of highway. Even the most populated places seem bleak, such as the bustling Midtown street of the film's opening scene. There is the ever present manic buzz of the city, but it is vaguely melancholic. The feeling produced is a kind of muted agitation which is in keeping with the tone of the film. So those are just some of the reasons this film is very 70s. It's a quick gritty little film that makes for intense viewing if the viewer is willing to pay close attention.